Although the person of the sovereign is shared with 15 other independent countries within the Commonwealth of Nations, each country's monarchy is separate and legally distinct. As a result, the current monarch is officially titled Queen of Canada and, in this capacity, she, her consort, and other members of the Canadian Royal Family undertake public and private functions domestically and abroad as representatives of Canada. However, the Queen is the only member of the Royal Family with any constitutional role. While some powers are exercisable only by the sovereign (such as appointing governors general), most of the monarch's operational and ceremonial duties (such as summoning the House of Commons and accrediting ambassadors) are exercised by his or her representative, the Governor General of Canada. In Canada's provinces, the monarch in right of each is represented by a lieutenant governor. As territories fall under the federal jurisdiction, they each have a commissioner, rather than a lieutenant governor, who represents the federal Crown-in-Council directly. As all executive authority is vested in the sovereign, their assent is required to allow for bills to become law and for letters patent and orders in council to have legal effect. While the power for these acts stems from the Canadian people through the constitutional conventions of democracy, executive authority remains vested in the Crown and is only entrusted by the sovereign to their government on behalf of the people, underlining the Crown's role in safeguarding the rights, freedoms, and democratic system of government of Canadians, and reinforcing the fact that "governments are the servants of the people and not the reverse". Thus, within a constitutional monarchy the sovereign's direct participation in any of these areas of governance is limited, with the sovereign normally exercising executive authority only on the advice of the executive committee of the Queen's Privy Council for Canada, with the sovereign's legislative and judicial responsibilities largely carried out through parliamentarians as well as judges and justices of the peace. The Crown today primarily functions as a guarantor of continuous and stable governance and a nonpartisan safeguard against abuse of power, the sovereign acting as a custodian of the Crown's democratic powers and a representation of the "power of the people above government and political parties". 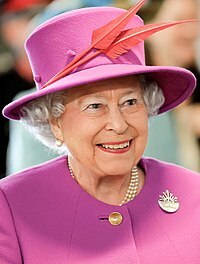 Elizabeth II is the reigning sovereign of each of the 16 Commonwealth realms. The person who is the Canadian sovereign is equally shared with 15 other monarchies (a grouping, including Canada, known informally as the Commonwealth realms) in the 52-member Commonwealth of Nations, with the monarch residing predominantly in the oldest and most populous realm, the United Kingdom, and viceroys (the Governor General of Canada in the federal sphere and a lieutenant governor in each province) acting as the sovereign's representatives in Canada. The emergence of this arrangement paralleled the fruition of Canadian nationalism following the end of the First World War and culminated in the passage of the Statute of Westminster in 1931. Since then, the pan-national Crown has had both a shared and a separate character and the sovereign's role as monarch of Canada has been distinct to his or her position as monarch of any other realm,[n 3] including the United Kingdom. [n 4] Only Canadian federal ministers of the Crown may advise the sovereign on all matters of the Canadian state,[n 5] of which the sovereign, when not in Canada, is kept abreast by weekly communications with the federal viceroy. The monarchy thus ceased to be an exclusively British institution and in Canada became a Canadian, or "domesticated", establishment, though it is still often denoted as "British" in both legal and common language, for reasons historical, political, and of convenience. This division is illustrated in a number of ways: The sovereign, for example, holds a unique Canadian title and, when she and other members of the Royal Family are acting in public specifically as representatives of Canada, they use, where possible, Canadian symbols, including the country's national flag, unique royal symbols, armed forces uniforms, and the like, as well as Canadian Forces aircraft or other Canadian-owned vehicles for travel. Once in Canadian airspace, or arrived at a Canadian event taking place abroad, the Canadian Secretary to the Queen, officers of the Royal Canadian Mounted Police, and other Canadian officials will take over from whichever of their other realms' counterparts were previously escorting the Queen or other member of the Royal Family. The sovereign similarly only draws from Canadian funds for support in the performance of her duties when in Canada or acting as Queen of Canada abroad; Canadians do not pay any money to the Queen or any other member of the Royal Family, either towards personal income or to support royal residences outside of Canada. 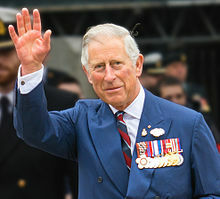 Charles, Prince of Wales, in Halifax, Nova Scotia, in 2014. Charles is the heir apparent to the Canadian throne. As in the other Commonwealth realms, the current heir apparent to the throne is Prince Charles, with the next four in the line of succession being the Prince's eldest son, Prince William, followed by William's three children Prince George, Princess Charlotte, and Prince Louis. Upon a demise of the Crown (the death or abdication of a sovereign), the late sovereign's heir immediately and automatically succeeds, without any need for confirmation or further ceremony; hence arises the phrase "The King is dead. Long live the King". It is customary for the accession of the new monarch to be publicly proclaimed by the governor general on behalf of the Privy Council, which meets at Rideau Hall after the accession. An appropriate period of mourning also follows, during which portraits of the recently deceased monarch are draped with black fabric and staff at government houses wear customary black armbands. The Canadian Broadcasting Corporation keeps a regularly updated plan for a "broadcast of national importance" announcing the demise of a sovereign and covering the aftermath, during which all regular programming and advertising is cancelled and on-call commentators contribute to a 24-hour news mode. The day of the funeral is likely to be a public holiday. The relationship between the Commonwealth realms is such that any change to the rules of succession to their respective crowns requires the unanimous consent of all the realms. Succession is governed by statutes, such as the Bill of Rights 1689, the Act of Settlement 1701, and the Acts of Union 1707. In 1936, King Edward VIII abdicated and any possible future descendants of his were excluded from the line of succession. As the Statute of Westminster 1931 disallowed the UK from legislating for Canada, including in relation to succession, Order in Council P.C. 3144 was issued, expressing the Cabinet's request and consent for His Majesty's Declaration of Abdication Act 1936 to become part of the laws of Canada and the Succession to the Throne Act 1937 gave parliamentary ratification to that action, together bringing the Act of Settlement and Royal Marriages Act 1772 into Canadian law. The latter was deemed by the Cabinet in 1947 to be part of Canadian law,[n 8] as is the Bill of Rights 1689, according to the Supreme Court of Canada. The Department of External Affairs included all succession-related laws in its list of acts within Canadian law. In 2011, Canada committed to the Perth Agreement with the other Commonwealth realms, which proposed changes to the rules governing succession to remove male preference and removal of disqualification arising from marriage to a Roman Catholic. As a result of the Perth Agreement, the Canadian parliament passed the Canadian Succession to the Throne Act, 2013, which gave the country's assent to the Succession to the Crown Bill 2013, at that time proceeding in the parliament of the United Kingdom. Certain aspects of the succession rules have been challenged in the courts. For example, under the provisions of the Bill of Rights 1689 and the Act of Settlement 1701, Catholics are barred from succeeding to the throne; this prohibition has been upheld twice by Canadian courts, once in 2003 and again in 2014. Canada has no laws allowing for a regency, should the sovereign be a minor or debilitated; none have been passed by the Canadian parliament and it was made clear by successive Cabinets since 1937 that the United Kingdom's Regency Act had no applicability to Canada, as the Canadian Cabinet had not requested otherwise when the act was passed that year and again in 1943 and 1953. As the 1947 Letters Patent issued by King George VI permit the Governor General of Canada to exercise almost all of the monarch's powers in respect of Canada, the viceroy is expected to continue to act as the personal representative of the monarch, and not any regent, even if the monarch is a child or incapacitated. Canada's monarchy was established at Confederation, when its executive government and authority were declared (in section 9 of the Constitution Act, 1867) "to continue and be vested in the Queen". The Canadian monarchy is a federal one in which the Crown is unitary throughout all jurisdictions in the country, the sovereignty of the different administrations being passed on through the overreaching Crown itself as a part of the executive, legislative, and judicial operations in each of the federal and provincial spheres and the headship of state being a part of all equally. The Crown thus links the various governments into a federal state,[dead link] though it is simultaneously also "divided" into eleven legal jurisdictions, or eleven "crowns"—one federal and ten provincial—with the monarch taking on a distinct legal persona in each. [n 9][n 10] As such, the constitution instructs that any change to the position of the monarch or his or her representatives in Canada requires the consent of the Senate, the House of Commons, and the legislative assemblies of all the provinces. The governor general is appointed by the Queen on the advice of her federal prime minister and the lieutenant governors are appointed by the governor general on the advice of the federal prime minister. The commissioners of Canada's territories are appointed by the federal Governor-in-Council, at the recommendation of the Minister of Indian Affairs and Northern Development; but, as the territories are not sovereign entities, the commissioners are not personal representatives of the sovereign. The Advisory Committee on Vice-Regal Appointments, which may seek input from the relevant premier and provincial or territorial community, proposes candidates for appointment as governor general, lieutenant governor, and commissioner. As the living embodiment of the Crown, the sovereign is regarded as the personification of the Canadian state and,[n 11] as such, must, along with his or her viceregal representatives, "remain strictly neutral in political terms". The body of the reigning sovereign thus holds two distinct personas in constant coexistence: that of a natural-born human being and that of the state as accorded to him or her through law; the Crown and the monarch are "conceptually divisible but legally indivisible ... [t]he office cannot exist without the office-holder",[n 12] so, even in private, the monarch is always "on duty". The terms the state, the Crown, the Crown in Right of Canada, Her Majesty the Queen in Right of Canada (French: Sa Majesté la Reine du chef du Canada), and similar are all synonymous and the monarch's legal personality is sometimes referred to simply as Canada. As such, the king or queen of Canada is the employer of all government officials and staff (including the viceroys, judges, members of the Canadian Forces, police officers, and parliamentarians),[n 13] the guardian of foster children (Crown wards), as well as the owner of all state lands (Crown land), buildings and equipment (Crown held property), state owned companies (Crown corporations), and the copyright for all government publications (Crown copyright). This is all in his or her position as sovereign, and not as an individual; all such property is held by the Crown in perpetuity and cannot be sold by the sovereign without the proper advice and consent of his or her ministers. The monarch is at the apex of the Canadian order of precedence and, as the embodiment of the state, is also the locus of oaths of allegiance,[n 14] required of many of the aforementioned employees of the Crown, as well as by new citizens, as by the Oath of Citizenship. Allegiance is given in reciprocation to the sovereign's Coronation Oath, wherein he or she promises "to govern the Peoples of ... Canada ... according to their respective laws and customs". 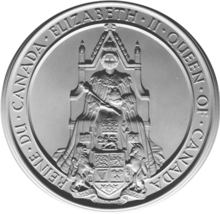 The Great Seal of Canada used during the reign of Queen Elizabeth II. Though it has been argued that the term head of state is a republican one inapplicable in a constitutional monarchy such as Canada, where the monarch is the embodiment of the state and thus cannot be head of it, the sovereign is regarded by official government sources, judges, constitutional scholars, and pollsters as the head of state, while the governor general and lieutenant governors are all only representatives of, and thus equally subordinate to, that figure. Some governors general, their staff, government publications, and constitutional scholars like Edward McWhinney and C. E. S. Franks have, however, referred to the position of governor general as that of Canada's head of state, though sometimes qualifying the assertion with de facto or effective; Franks has hence recommended that the governor general be named officially as the head of state. Still others view the role of head of state as being shared by both the sovereign and her viceroys. Since 1927, governors general have been received on state visits abroad as though they were heads of state. Officials at Rideau Hall have attempted to use the Letters Patent of 1947 as justification for describing the governor general as head of state. However, the document makes no such distinction, nor does it effect an abdication of the sovereign's powers in favour of the viceroy, as it only allows the governor general to "act on The Queen's behalf". Dr. D. Michael Jackson, former Chief of Protocol of Saskatchewan, argued that Rideau Hall had been attempting to "recast" the governor general as head of state since the 1970s and doing so preempted both the Queen and all of the lieutenant governors. This caused not only "precedence wars" at provincial events (where the governor general usurped the lieutenant governor's proper spot as most senior official in attendance) and Governor General Adrienne Clarkson to accord herself precedence before the Queen at a national occasion, but also constitutional issues by "unbalancing ... the federalist symmetry". This has been regarded as both a natural evolution and as a dishonest effort to alter the constitution without public scrutiny. In a poll conducted by Ipsos-Reid following the first prorogation of the 40th parliament on 4 December 2008, it was found that 42% of the sample group thought the prime minister was head of state, while 33% felt it was the governor general. Only 24% named the Queen as head of state, a number up from 2002, when the results of an EKOS Research Associates survey showed only 5% of those polled knew the Queen was head of state (69% answered that it was the prime minister). Canada's constitution is based on the Westminster parliamentary model, wherein the role of the Queen is both legal and practical, but not political. The sovereign is vested with all the powers of state, collectively known as the Royal Prerogative, leading the populace to be considered subjects of the Crown. However, as the sovereign's power stems from the people and the monarch is a constitutional one, he or she does not rule alone, as in an absolute monarchy. Instead, the Crown is regarded as a corporation sole, with the monarch being the centre of a construct in which the power of the whole is shared by multiple institutions of government—the executive, legislative, and judicial—acting under the sovereign's authority, which is entrusted for exercise by the politicians (the elected and appointed parliamentarians and the ministers of the Crown generally drawn from among them) and the judges and justices of the peace. The monarchy has thus been described as the underlying principle of Canada's institutional unity and the monarch as a "guardian of constitutional freedoms" whose "job is to ensure that the political process remains intact and is allowed to function." The Great Seal of Canada "signifies the power and authority of the Crown flowing from the sovereign to [the] parliamentary government" and is applied to state documents such as royal proclamations and letters patent commissioning cabinet ministers, senators, judges, and other senior government officials. The "lending" of royal authority to the Cabinet is illustrated by the great seal being entrusted by the governor general, the official keeper of the seal, to the Minister of Innovation, Science, and Economic Development, who is ex officio the Registrar General of Canada. Upon a change of government, the seal is temporarily returned to the governor general and then "lent" to the next incoming registrar general. The Crown is the pinnacle of the Canadian Forces, with the constitution placing the monarch in the position of commander-in-chief of the entire force, though the governor general carries out the duties attached to the position and also bears the title of Commander-in-Chief in and over Canada. Further, included in Canada's constitution are the various treaties between the Crown and Canadian First Nations, Inuit, and Métis peoples, who view these documents as agreements directly and only between themselves and the reigning monarch, illustrating the relationship between sovereign and aboriginals. The government of Canada—formally termed Her Majesty's Government—is defined by the constitution as the Queen acting on the advice of her Privy Council; what is technically known as the Queen-in-Council, or sometimes the Governor-in-Council, referring to the governor general as the Queen's stand-in. 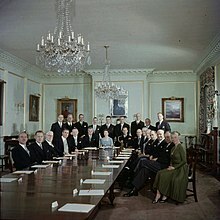 One of the main duties of the Crown is to "ensure that a democratically elected government is always in place," which means appointing a prime minister to thereafter head the Cabinet—a committee of the Privy Council charged with advising the Crown on the exercise of the Royal Prerogative. The Queen is informed by her viceroy of the swearing-in and resignation of prime ministers and other members of the ministry, remains fully briefed through regular communications from her Canadian ministers, and holds audience with them whenever possible. By convention, the content of these communications and meetings remains confidential so as to protect the impartiality of the monarch and her representative. The appropriateness and viability of this tradition in an age of social media has been questioned. In the construct of constitutional monarchy and responsible government, the ministerial advice tendered is typically binding, meaning the monarch reigns but does not rule, the Cabinet ruling "in trust" for the monarch. This has been the case in Canada since the Treaty of Paris ended the reign of the territory's last absolute monarch, King Louis XV. However, the Royal Prerogative belongs to the Crown and not to any of the ministers and the royal and viceroyal figures may unilaterally use these powers in exceptional constitutional crisis situations (an exercise of the reserve powers),[n 15] thereby allowing the monarch to make sure "that the government conducts itself in compliance with the constitution." There are also a few duties which must be specifically performed by, or bills that require assent by, the Queen. 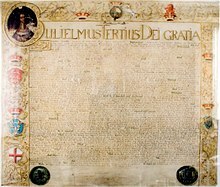 The Royal Prerogative also extends to foreign affairs, including the ratification of treaties, alliances, international agreements, and declarations of war, the accreditation of Canadian high commissioners and ambassadors and receipt of similar diplomats from foreign states, and the issuance of Canadian passports, which remain the sovereign's property. It also includes the creation of dynastic and national honours, though only the latter are established on official ministerial advice. 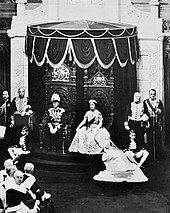 All laws in Canada are the monarch's and the sovereign is one of the three components of parliament—formally called the Queen-in-Parliament—but the monarch and viceroy do not participate in the legislative process save for the granting of Royal Assent, which is necessary for a bill to be enacted as law. Either figure or a delegate may perform this task and the constitution allows the viceroy the option of deferring assent to the sovereign. The governor general is further responsible for summoning the House of Commons, while either the viceroy or monarch can prorogue and dissolve the legislature, after which the governor general usually calls for a general election. The new parliamentary session is marked by either the monarch, governor general, or some other representative reading the Speech from the Throne. Members of Parliament must recite the Oath of Allegiance before they may take their seat. Further, the official opposition is traditionally dubbed as Her Majesty's Loyal Opposition, illustrating that, while its members are opposed to the incumbent government, they remain loyal to the sovereign (as personification of the state and its authority). The monarch does not have the prerogative to impose and collect new taxes without the authorization of an Act of Parliament. The consent of the Crown must, however, be obtained before either of the houses of parliament may even debate a bill affecting the sovereign's prerogatives or interests and no act of parliament binds the Queen or her rights unless the act states that it does. The sovereign is responsible for rendering justice for all her subjects and is thus traditionally deemed the fount of justice and her position in the Canadian courts formally dubbed the Queen on the Bench. The Arms of Her Majesty in Right of Canada are traditionally displayed in Canadian courtrooms, as is a portrait of the sovereign. The monarch does not personally rule in judicial cases; this function of the royal prerogative is instead performed in trust and in the Queen's name by officers of Her Majesty's court. Common law holds the notion that the sovereign "can do no wrong": the monarch cannot be prosecuted in her own courts—judged by herself—for criminal offences. Civil lawsuits against the Crown in its public capacity (that is, lawsuits against the Queen-in-Council) are permitted, but lawsuits against the monarch personally are not cognizable. In international cases, as a sovereign and under established principles of international law, the Queen of Canada is not subject to suit in foreign courts without her express consent. Within the royal prerogative is also the granting of immunity from prosecution, mercy, and pardoning offences against the Crown. Since 1878, the prerogative of pardon has always been exercised upon the recommendation of ministers. 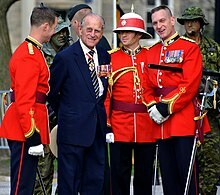 Prince Philip with the Royal Canadian Regiment as their colonel-in-chief, April 2013. Members of the Royal Family have been present in Canada since the late 18th century, their reasons including participating in military manoeuvres, serving as the federal viceroy, or undertaking official royal tours. A prominent feature of the latter are numerous royal walkabouts, the tradition of which was initiated in 1939 by Queen Elizabeth when she was in Ottawa and broke from the royal party to speak directly to gathered veterans. Usually important milestones, anniversaries, or celebrations of Canadian culture will warrant the presence of the monarch, while other royals will be asked to participate in lesser occasions. A household to assist and tend to the monarch forms part of the royal party. Official duties involve the sovereign representing the Canadian state at home or abroad, or her relations as members of the Royal Family participating in government organized ceremonies either in Canada or elsewhere;[n 16] sometimes these individuals are employed in asserting Canada's sovereignty over its territories. [n 17] The advice of the Canadian Cabinet is the impetus for royal participation in any Canadian event, though, at present, the Chief of Protocol and his staff in the Department of Canadian Heritage are, as part of the State Ceremonial and Canadian Symbols Program, responsible for orchestrating any official events in or for Canada that involve the Royal Family. Conversely, unofficial duties are performed by Royal Family members on behalf of Canadian organizations of which they may be patrons, through their attendance at charity events, visiting with members of the Canadian Forces as colonel-in-chief, or marking certain key anniversaries. The invitation and expenses associated with these undertakings are usually borne by the associated organization. In 2005 members of the Royal Family were present at a total of 76 Canadian engagements, as well as several more through 2006 and 2007. The main symbol of the monarchy is the sovereign herself, described as "the personal expression of the Crown in Canada," and her image is thus used to signify Canadian sovereignty and government authority—her image, for instance, appearing on currency, and her portrait in government buildings. The sovereign is further both mentioned in and the subject of songs, loyal toasts, and salutes. A royal cypher, appearing on buildings and official seals, or a crown, seen on provincial and national coats of arms, as well as police force and Canadian Forces regimental and maritime badges and rank insignia, is also used to illustrate the monarchy as the locus of authority, the latter without referring to any specific monarch. Since the days of King Louis XIV, the monarch is the fount of all honours in Canada and the orders, decorations, and medals form "an integral element of the Crown." Hence, the insignia and medallions for these awards bear a crown, cypher, and/or portrait of the monarch. Similarly, the country's heraldic authority was created by the Queen and, operating under the authority of the governor general, grants new coats of arms, flags, and badges in Canada. Use of the royal crown in such symbols is a gift from the monarch showing royal support and/or association, and requires her approval before being added. Members of the Royal Family also act as ceremonial colonels-in-chief, commodores-in-chief, captains-general, air commodores-in-chief, generals, and admirals of various elements of the Canadian Forces, reflecting the Crown's relationship with the country's military through participation in events both at home and abroad. [n 19] The monarch also serves as the Commissioner-in-Chief, Prince Charles as Honorary Commissioner, and Prince Edward as Honorary Deputy Commissioner of the Royal Canadian Mounted Police. A number of Canadian civilian organizations have association with the monarchy, either through their being founded via a royal charter, having been granted the right to use the prefix royal before their name, or because at least one member of the Royal Family serves as a patron. In addition to The Prince's Charities Canada, established by Charles, Prince of Wales, some other charities and volunteer organizations have also been founded as gifts to, or in honour of, some of Canada's monarchs or members of the Royal Family, such as the Victorian Order of Nurses (a gift to Queen Victoria for her Diamond Jubilee in 1897), the Canadian Cancer Fund (set up in honour of King George V's Silver Jubilee in 1935), and the Queen Elizabeth II Fund to Aid in Research on the Diseases of Children. A number of awards in Canada are likewise issued in the name of previous or present members of the Royal Family. Further, organizations will give commemorative gifts to members of the Royal Family to mark a visit or other important occasion. The Canadian Royal Family (French: Famille Royale Canadienne) is a group of people related to the country's monarch and, as such, belonging to the House of Windsor (French: Maison de Windsor). There is no legal definition of who is or is not a member of the group, though the Government of Canada maintains a list of immediate members, and stipulates that those in the direct line of succession who bear the style of Royal Highness (Altesse Royale) are subjects of, and owe their allegiance specifically to, the reigning king or queen of Canada. Unlike in the United Kingdom, the monarch is the only member of the Royal Family with a title established through Canadian law. It would be possible for others to be granted distinctly Canadian titles (as is the case for the Duke of Rothesay (Prince Charles) in Scotland), but they have always been, and continue to only be, accorded the use of a courtesy title in Canada, which is that which they have been granted via letters patent in the UK, though they are also in Canada translated to French. According to the Canadian Royal Heritage Trust, Prince Edward Augustus, Duke of Kent and Strathearn—due to his having lived in Canada between 1791 and 1800, and fathering Queen Victoria—is the "ancestor of the modern Canadian Royal Family". Nonetheless, the concept of the Canadian Royal Family did not emerge until after the passage of the Statute of Westminster in 1931, when Canadian officials only began to overtly consider putting the principles of Canada's new status as an independent kingdom into effect. At first, the monarch was the only member of the Royal Family to carry out public ceremonial duties solely on the advice of Canadian ministers; King Edward VIII became the first to do so when in July 1936 he dedicated the Canadian National Vimy Memorial in France. [n 16] Over the decades, however, the monarch's children, grandchildren, cousins, and their respective spouses began to also perform functions at the direction of the Canadian Crown-in-Council, representing the monarch within Canada or abroad. But it was not until October 2002 when the term Canadian Royal Family was first used publicly and officially by one of its members: in a speech to the Nunavut legislature at its opening, Queen Elizabeth II stated: "I am proud to be the first member of the Canadian Royal Family to be greeted in Canada's newest territory." Princess Anne used it again when speaking at Rideau Hall in 2014. 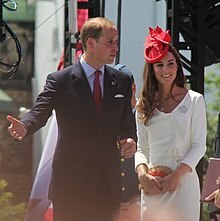 By 2011, both Canadian and British media were referring to "Canada's royal family" or the "Canadian royal family". The press frequently follows the movements of the Royal Family, and can, at times, affect the group's popularity, which has fluctuated over the years. Mirroring the mood in the United Kingdom, the family's lowest approval was during the mid-1980s to 1990s, when the children of the monarch were enduring their divorces and were the targets of negative tabloid reporting. A number of buildings across Canada are reserved by the Crown for the use of the monarch and her viceroys. Each is called Government House, but may be customarily known by some specific name. The sovereign's and governor general's official residences are Rideau Hall in Ottawa and the Citadelle in Quebec City. [n 26] Each of these royal seats holds pieces from the Crown Collection. Further, though neither was ever used for their intended purpose, Hatley Castle in British Columbia was purchased in 1940 by King George VI in Right of Canada to use as his home during the course of World War II, and the Emergency Government Headquarters, built in 1959 at CFS Carp and decommissioned in 1994, included a residential apartment for the sovereign or governor general in the case of a nuclear attack on Ottawa. Monarchs and members of their family have also owned in a private capacity homes and land in Canada: King Edward VIII owned Bedingfield Ranch, near Pekisko, Alberta; the Marquess of Lorne and Princess Louise owned a cottage on the Cascapédia River in Quebec; and Princess Margaret owned Portland Island between its gifting to her by the Crown in Right of British Columbia in 1958 and her death in 2002, though she offered it back to the Crown on permanent loan in 1966 and the island and surrounding waters eventually became Princess Margaret Marine Park. To assist the Queen in carrying out her official duties on behalf of Canada, she appoints various people to her Canadian household. Along with the Canadian Secretary to the Queen, the monarch's entourage includes two ladies-in-waiting, the Canadian Equerry-in-Waiting to the Queen, the Queen's Police Officer, the Duke of Edinburgh's Police Officer, the Queen's Honorary Physician, the Queen's Honorary Dental Surgeon, and the Queen's Honorary Nursing Officer—the latter three being drawn from the Canadian Forces. Prince Edward, Earl of Wessex, also has a Canadian private secretary and his wife, Sophie, Countess of Wessex, a lady-in-waiting. Air transportation for the Royal Family is provided by the Royal Canadian Air Force 412 Transport Squadron. There are three household regiments specifically attached to the Royal Household—the Governor General's Foot Guards, the Governor General's Horse Guards, and the Canadian Grenadier Guards. There are also two chapels royal in Ontario. Though not officially a royal chapel, St. Bartholomew's Anglican Church, located across MacKay Street from Rideau Hall, is regularly used by governors general and their families and sometimes by the sovereign and other members of the Royal Family, as well as by viceregal household staff, their families, and members of the Governor General's Foot Guards, for whom the church also serves as a regimental chapel. The Canadian monarchy can trace its ancestral lineage back to the kings of the Angles and the early Scottish kings and through the centuries since the claims of King Henry VII in 1497 and King Francis I in 1534; both being blood relatives of the current Canadian monarch. Former Prime Minister Stephen Harper said of the Crown that it "links us all together with the majestic past that takes us back to the Tudors, the Plantagenets, the Magna Carta, habeas corpus, petition of rights, and English common law." Though the first French and British colonizers of Canada interpreted the hereditary nature of some indigenous North American chieftainships as a form of monarchy, it is generally accepted that Canada has been a territory of a monarch or a monarchy in its own right only since the establishment of colony of Canada in the early 16th century; according to historian Jacques Monet, the Canadian Crown is one of the few that have survived through uninterrupted succession since before its inception. After the Canadian colonies of France were, via war and treaties, ceded to the British Crown, and the population was greatly expanded by those loyal to George III fleeing north from persecution during and following the American Revolution, British North America was in 1867 confederated by Queen Victoria to form Canada as a kingdom in its own right. By the end of the First World War, the increased fortitude of Canadian nationalism inspired the country's leaders to push for greater independence from the King in his British Council, resulting in the creation of the uniquely Canadian monarchy through the Statute of Westminster, which was granted Royal Assent in 1931. Only five years later, Canada had three successive kings in the space of one year, with the death of George V, the accession and abdication of Edward VIII, and his replacement by George VI. The latter became in 1939 the first reigning monarch of Canada to tour the country (though previous kings had done so before their accession). As the ease of travel increased, visits by the sovereign and other Royal Family members became more frequent and involved, seeing Queen Elizabeth II officiate at various moments of importance in the nation's history, one being when she proclaimed the country to be fully independent, via constitutional patriation, in 1982. That act is said to have entrenched the monarchy in Canada, due to the stringent requirements, as laid out in the amending formula, that must be met in order to alter the monarchy in any way. Through the 1960s and 1970s, the rise of Quebec nationalism and changes in Canadian identity created an atmosphere where the purpose and role of the monarchy came into question. Some references to the monarch and the monarchy were removed from the public eye and moves were made by the federal government to constitutionally alter the Crown's place and role in Canada, first by explicit legal amendments and later by subtle attrition impelled by elements of the public service, the Cabinet, and governors general and their staff alike. But, provincial and federal ministers, along with loyal national citizen's organizations, ensured that the system remained the same in essence. By 2002, the royal tour and associated fêtes for the Queen's Golden Jubilee proved popular with Canadians across the country, though Canada's first republican organization since the 1830s was also founded that year. Celebrations took place to mark Queen Elizabeth II's Diamond Jubilee in 2012, the first such event in Canada since that for Victoria in 1897. On 9 September 2015, she became the second-longest reigning monarch in Canadian history (preceded only by King Louis XIV); events were organised to celebrate her as the "longest-reigning sovereign in Canada's modern era." It has been theorised the monarchy is so prevalent in Canada—by way of all manner of symbols, place names, royal tours, etc.—that Canadians fail to take note of it. Commentators have in the late 20th and early 21st centuries stated that contemporary Canadians had and have a poor understanding of the Canadian monarchy, Michael D. Jackson saying in his book The Crown and Canadian Federalism that this is part of a wider ignorance about Canadian civics. While David Smith researched for his 1995 book The Invisible Crown, he found it difficult to "find anyone who could talk knowledgeably about the subject". Former Governor General Adrienne Clarkson said there is "an abysmal lack of knowledge about the system" and Senator Lowell Murray wrote in 2003: "The Crown has become irrelevant to most Canadians' understanding of our system of Government", which he attributed to the "fault of successive generations of politicians, of an educational system that has never given the institution due study, and of past viceregal incumbents themselves". These comments were echoed by teacher and author Nathan Tidridge, who asserted that, beginning in the 1960s, the role of the Crown disappeared from provincial education curricula, as the general subject of civics came to receive less attention. He said Canadians are being "educated to be illiterate, ambivalent, or even hostile toward our constitutional monarchy". Michael Valpy also pointed to the fact that "The crown's role in the machinery of Canada's constitutional monarchy rarely sees daylight. Only a handful of times in our history has it been subjected to glaring sunshine, unfortunately resulting in a black hole of public understanding as to how it works." He later iterated: "the public's attention span on the constitutional intricacies of the monarchy is clinically short". In the 2010s, a "growing interest in the Crown and its prerogatives" was observed, as evidenced by "a burst of articles, books and conferences". This was attributed to the coincidental occurrence of publicly prominent events over a number of years, including the 2008 prorogation dispute; an increased use of royal symbols as directed by the Cabinet while headed by Stephen Harper, including two consecutive royal tours; court cases focusing on the Oath of Citizenship; and increasingly active governors. Smith and Philippe Lagassé noted in early 2016 that post-secondary students were giving more focus to the subject of the Crown. To date, outside of academic circles, there has been little national debate on the Canadian monarchy, a subject about which most Canadians are generally unaware. Out of Canada's three most prominent political parties, neither the Liberal Party nor the Conservative Party is officially in favour of abolishing the monarchy (though the latter makes support for constitutional monarchy a founding principle in its policy declaration) and the New Democratic Party (NDP) has no official position on the role of the Crown. Only some Members of Parliament belonging to these parties and the leaders of the Bloc Québécois have made any statements suggesting abolition of the monarchy. Canada has two special-interest groups representing the debate, who frequently argue the issue in the media: the Monarchist League of Canada and Citizens for a Canadian Republic. There are also other organizations that support and advocate the monarchy, such as the United Empire Loyalists' Association of Canada, the Canadian Royal Heritage Trust, the Orange Order in Canada, the Friends of the Canadian Crown, and Canadian Friends of the Royal Family. The idea of a uniquely Canadian monarch, either one descended from the House of Windsor or coming from a First Nations royal house, has been proffered as an alternative. However, there has been no popular or official support for such a change. ^ The date of the first establishment of monarchy in Canada varies: some sources give the year as 1497, when John Cabot landed somewhere along the North American coast (most likely Nova Scotia or Newfoundland) claiming an undefined extent of land for King Henry VII, while others put it at 1534, when the colony of Canada was founded in the name of King Francis I. Although the exact date differs, the fact that a monarchical form of governance has existed since the 16th century is in common agreement. ^ The term was first coined by Governor General the Lord Grey in 1905, when he stated in a telegram to King Edward VII regarding the inauguration of Alberta and Saskatchewan into Confederation: "[each one] a new leaf in Your Majesty's Maple Crown". ^ a b On a number of occasions, the sovereign has carried out foreign relations as the representative uniquely of Canada, such as the visits to the United States by King George VI in 1939 and Queen Elizabeth II in 1957. ^ The English Court of Appeal ruled in 1982, while "there is only one person who is the Sovereign within the British Commonwealth ... in matters of law and government the Queen of the United Kingdom, for example, is entirely independent and distinct from the Queen of Canada." ^ In 1997, then Prime Minister of the United Kingdom Tony Blair intended to offer a life peerage to Canadian businessman Conrad Black. However, citing the 1919 Nickle Resolution, the Canadian Cabinet advised the Queen not to grant Black such an honour. If Blair had not yielded, the Queen would have been in the situation of having to grant an honour on the advice of her British prime minister and to object to the same as Queen of Canada on the advice of then Canadian Prime Minister Jean Chrétien. ^ The only Canadian monarch to abdicate, Edward VIII, did so with the authorization of the Canadian government granted in His Majesty's Declaration of Abdication Act, 1936, and the Succession to the Throne Act, 1937, later confirmed this in law. ^ Gary Toffoli of the Canadian Royal Heritage Trust stated that the approval given by the Queen in her Canadian Council in 1981 to the marriage of Charles, Prince of Wales, and Lady Diana Spencer separately to the same approval given by the Queen in her British Council illustrated the existence of the Royal Marriages Act in Canadian law. In 1947, the King in his Canadian Council gave the same consent to the marriage of Princess Elizabeth to Philip Mountbatten, again separate from the approval he gave in his British Council. ^ For example, if a lawsuit is filed against the federal government, the respondent is formally described as Her Majesty the Queen in Right of Canada, or simply Regina. Likewise, in a case in which a party sues both the province of Saskatchewan and the federal government, the respondents would be formally called Her Majesty the Queen in Right of Saskatchewan and Her Majesty the Queen in Right of Canada. ^ Illustrative of this arrangement is property transfers; of this, the Ontario Ministry of Natural Resources states: "When public land is required by the federal government or one of its departments, or any provincial ministry, the land itself is not transferred. What is transferred is the responsibility to manage the lands on behalf of Her Majesty the Queen (HMQ). This is accomplished by an Order in Council or a Minister's Order which transfers management of land either from HMQ in right of Ontario to HMQ in right of Canada as represented by a department or to HMQ in right of Ontario as represented by another ministry. The Crown does not transfer ownership to itself." ^ The sovereign has been described by Eugene Forsey as the "symbolic embodiment of the people—not a particular group or interest or party, but the people, the whole people"; his daughter, Helen Forsey, said of his opinion on the Crown: "For him, the essence of the monarchy was its impartial representation of the common interests of the citizenry as a whole, as opposed to those of any particular government." The Department of Canadian Heritage said the Crown serves as the "personal symbol of allegiance, unity and authority for all Canadians," a concept akin to that expressed by King Louis XIV: "l'État, c'est moi", or, "I am the state". Robertson Davies stated in 1994: "the Crown is the consecrated spirit of Canada," and past Ontario chairman of the Monarchist League of Canada Gary Toffoli opined: "The Queen is the legal embodiment of the state at both the national and the provincial levels ... she is our sovereign and it is the role of the Queen, recognized by the constitutional law of Canada, to embody the state." ^ As Peter Boyce put it: "The Crown as a concept cannot be disentangled from the person of the monarch, but standard reference to the Crown extends well beyond the Queen's person." ^ The Supreme Court found in the 1980 case Attorney General of Quebec v. Labrecque that civil servants in Canada are not contracted by an abstraction called "the state", but rather they are employed by the monarch, who "enjoys a general capacity to contract in accordance with the rule of ordinary law." ^ It is stated in the Rules & Forms of the House of Commons of Canada that "allegiance to the King means allegiance to the Country." ^ a b c Though the Royal Family represents other countries abroad, as directed by their respective cabinets, and typically the governor general will undertake state visits and other foreign duties on behalf of the Queen of Canada, members of the Royal Family will also take part in Canadian events overseas. ^ In 1970, Queen Elizabeth II, the Duke of Edinburgh, Prince Charles, and Princess Anne undertook a tour of Northern Canada, in part to demonstrate to an unconvinced American government and the Soviet Union that Canada had certain claim to its Arctic territories, which were strategic during the Cold War. ^ Such events include Troopings of the Colour, inspections of the troops, and anniversaries of key battles; whenever the sovereign or a member of her family is in Ottawa, they lay a wreath at the National War Memorial. ^ Moroccan and Chinese officials claim, respectively, that members of the Royal Family are also directly descended from the Islamic prophet, Muhammad and Tang Dynasty Chinese Emperors. ^ For instance, while he never held the style His Royal Highness, Angus Ogilvy was included in the Department of Canadian Heritage's royal family list, but was not considered a member of the British Royal Family. ^ Two Canadian citizens married into the Royal Family: In 1988, Sylvana Jones (née Tomaselli in Placentia, Newfoundland) wed George Windsor, Earl of St Andrews, a great-grandson of King George V, and, on 18 May 2008, Autumn Kelly, originally from Montreal, married Queen Elizabeth II's eldest grandson, Peter Phillips. The latter couple has two children, 14th and 15th in line to the throne, who each hold dual Canadian and British citizenship, as do the three children of George Windsor, though only the youngest, Lady Amelia Windsor, is in line to the throne, currently 36th. More distantly, Princes Boris and Hermann Friedrich of Leiningen, great-great-great grandsons of Queen Victoria, are also Canadian citizens. ^ As early as 1959, it was recognized that the Queen was "equally at home in all her realms"; By the 1960s, loyal societies in Canada recognized the Queen's cousin, Princess Alexandra, The Honourable Lady Ogilvy, as a "Canadian princess"; and, at the time of the 2011 royal tour of Prince William, Duke of Cambridge and Catherine, Duchess of Cambridge, both Michael Valpy, writing for the CBC, and The Globe and Mail referred to William as "a prince of Canada". ^ Princess Elizabeth, Duchess of Edinburgh, said in 1951 that when in Canada she was "amongst fellow countrymen". When queen, she, in 1983, before departing the United States for Canada, said "I'm going home to Canada tomorrow" and, in 2005, said she agreed with the statement earlier made by her mother, Queen Elizabeth, that Canada felt like a "home away from home". Similarly, the Queen stated in 2010, in Nova Scotia, "it is very good to be home". ^ Prince Edward, Duke of Kent and Strathearn, served as the Commander of British North American troops in Canada's Maritimes for nine years after 1791, mostly in Halifax; his granddaughter, Princess Louise, Marchioness of Lorne, lived in Canada between 1878 and 1883 as viceregal consort; and her brother, Prince Arthur, Duke of Connaught and Strathearn, resided in Canada first through 1870 as a member of the Canadian Militia, defending Canada from the Fenian Raids, and then as governor general from 1911 until 1916. Later, for six years beginning in 1940, Princess Alice, Countess of Athlone (a great-grandchild of the Duke of Kent), lived in Canada with her husband, the Earl of Athlone (himself a great-grandchild of King George III), while he served as governor general. ^ While the government houses are the Queen's official residences in Canada, they are almost exclusively occupied by the sovereign's representative in each of those jurisdictions that have a government house or houses. Two government houses—Rideau Hall and the Citadelle of Quebec—are regarded as federal residences of the Canadian monarch and his or her representative, the governor general. ^ See Note 2 at Government of Canada. ^ Department of Canadian Heritage. "Crown in Canada > Royal Family > His Royal Highness The Prince of Wales". Queen's Printer for Canada. Archived from the original on 20 December 2013. Retrieved 1 August 2013. ^ David E. Smith (June 2010). "The Crown and the Constitution: Sustaining Democracy?" (PDF). Conference on the Crown. Ottawa: Queen's University. p. 6. Retrieved 3 March 2016. ^ Smith, David E. (1995). The Invisible Crown. Toronto: University of Toronto Press. pp. 87–90. ISBN 0-8020-7793-5. ^ J.A. Weiler (13 August 2014). "McAteer v. Canada (Attorney General), 2014 ONCA 578". Court of Appeal for Ontario. Archived from the original on 10 February 2015. Retrieved 17 February 2016. ^ Government of Canada. "Discover Canada - Understanding the Oath". Citizenship and Immigration Canada. Retrieved 17 February 2016. ^ "Parliamentary Framework - Role of the Crown". Parliament of Canada. October 2015. Retrieved 17 February 2016. ^ Philippe Lagassé (2 March 2015). "Citizenship and the hollowed Canadian Crown". Institute for Research on Public Policy. Retrieved 17 February 2016. ^ John Allen (1849). "Inquiry into the rise and growth of the royal prerogative in England". Longman, Brown, Green, and Longmans. pp. 4–7. Retrieved 17 February 2016. ^ Thomas Isaac (1994). "The Concept of Crown and Aboriginal Self-Government" (PDF). The Canadian Journal of Native Studies. Retrieved 17 February 2016. ^ Claude Bouchard (16 February 2016). "Jugement No. 200-17-018455-139" (PDF) (in French). Cour supérieure du Québec. p. 16. Retrieved 17 February 2016 – via Le Devoir. ^ a b c Romaniuk, Scott Nicholas; Wasylciw, Joshua K. (February 2015). "Canada's Evolving Crown: From a British Crown to a "Crown of Maples"". American, British and Canadian Studies Journal. 23 (1). doi:10.1515/abcsj-2014-0030. ^ Department of Canadian Heritage (2015). "Crown of Maples: Constitutional Monarchy in Canada" (PDF). Her Majesty the Queen in Right of Canada. p. 3. Archived from the original (PDF) on 10 November 2012. Retrieved 16 February 2016. ^ "Queen and Canada". The Royal Household. Retrieved 16 February 2016. ^ "The Queen of Canada". Government of Canada. Archived from the original on 24 February 2016. Retrieved 16 February 2016. ^ Hicks, Bruce (2012). "The Westminster Approach to Prorogation, Dissolution and Fixed Date Elections" (PDF). Canadian Parliamentary Review. 35 (2): 20. ^ Government of Canada (4 December 2015). "Why does the Governor General give the Speech?". Queen's Printer for Canada. Retrieved 17 December 2015. ^ Aboriginal Affairs and Northern Development Canada. "Commissionners of the Territories". Archived from the original on 2011-10-13. ^ Marleau, Robert; Montpetit, Camille. "House of Commons Procedure and Practice > 1. Parliamentary Institutions". Queen's Printer for Canada. Archived from the original on 28 August 2011. Retrieved 28 September 2009. ^ Parsons, John (1 July 2008). "John Cabot". Historica Canada. Retrieved 20 January 2014. ^ Bousfield, Arthur; Toffoli, Garry. "The Sovereigns of Canada". Canadian Royal Heritage Trust. Archived from the original on 16 August 2007. Retrieved 5 March 2010. ^ a b Department of Canadian Heritage. "Ceremonial and Canadian Symbols Promotion > The Canadian Monarchy". Queen's Printer for Canada. Retrieved 14 May 2009. ^ a b c Kenney, Jason (23 April 2007). "Speech to the Lieutenant Governors Meeting". Written at Regina. In Department of Canadian Heritage. Speeches > The Honourable Jason Kenney. Ottawa: Queen's Printer for Canada. Retrieved 27 January 2010. ^ a b c d Valpy, Michael (13 November 2009). "The monarchy: Offshore, but built-in". The Globe and Mail. Toronto. Retrieved 14 November 2009. ^ a b c Parliament of Canada. "Canada: A Constitutional Monarchy". Queen's Printer for Canada. Retrieved 25 September 2009. ^ Monet, Jacques. "The Canadian Encyclopedia". In Marsh, James Harley. Government > Parliamentary Institutions > Governor General. Toronto: Historica Foundation of Canada. Archived from the original on 11 February 2010. Retrieved 5 March 2010. ^ The Royal Household. "The Queen and the Commonwealth > Queen and Canada > History and present government". Queen's Printer. Retrieved 5 March 2010. ^ a b Coyne, Andrew (13 November 2009). "Defending the royals". Maclean's. Toronto: Roger's Communications. ISSN 0024-9262. Retrieved 18 February 2010. ^ a b Monet, Jacques (2007). "Crown and Country" (PDF). Canadian Monarchist News. Toronto: Monarchist League of Canada. Summer 2007 (26): 8. Archived from the original (PDF) on 25 June 2008. Retrieved 15 June 2009. ^ Grey, Albert (1 September 1905) [4 March 1905]. "Grey to Edward VII". In Doig, Ronald P. Earl Grey's Papers: An Introductory Survey (1 ed.). London: Private Libraries Association. ^ "The way forward with Canada's maple Crown". The Globe and Mail. Toronto. 14 November 2009. Retrieved 14 November 2009. ^ Buchan, John (1969). Canadian Occasions: Addresses. Manchester: Ayer Publishing. p. 94. ISBN 978-0-8369-1275-3. ^ a b c Department of Canadian Heritage. "Ceremonial and Canadian Symbols Promotion > The crown in Canada". Queen's Printer for Canada. Retrieved 19 February 2009. ^ a b Romney, Paul (1999). Getting it wrong: how Canadians forgot their past and imperilled Confederation. Toronto: University of Toronto Press. p. 273. ISBN 978-0-8020-8105-6. ^ a b The Royal Household. "The Queen and the Commonwealth > Queen and Canada > The Queen's role in Canada". Queen's Printer. Retrieved 15 May 2009. ^ Saskatchewan Office of the Provincial Secretary. "About OPS > Protocol Office > Protocol in Practice > The Crown". Queen's Printer for Saskatchewan. Retrieved 16 May 2009. ^ a b c d e f g Forsey, Helen (1 October 2010). "As David Johnson Enters Rideau Hall ..." The Monitor. Ottawa: Canadian Centre for Policy Alternatives. Retrieved 23 January 2011. ^ "Royal Style and Titles Act 1985". CanLII. Archived from the original on 6 June 2009. Retrieved 27 November 2015. ^ Moore, Oliver (29 June 2010). "Aye, aye, Ma'am". The Globe and Mail. Toronto. Retrieved 30 June 2010. ^ John, Ward (12 November 2009). "Prince Charles joins in national Remembrance Day ceremonies". The Telegram. Archived from the original on 14 November 2009. Retrieved 30 June 2010. ^ Deachman, Bruce (9 November 2009). "Royals arrive in Ottawa in final leg of cross-Canada tour". Ottawa Citizen. Retrieved 30 June 2010. ^ "Royal Respect for Canada's Vimy Heroes" (PDF). Canadian Monarchist News. Toronto: Monarchist League of Canada. Summer 2007 (26): 4. 2007. Archived from the original (PDF) on 25 June 2008. Retrieved 30 June 2010. ^ a b Paperny, Anna Mehler (26 June 2011). "Behind the royal tour, a businesslike Usher of the Black Rod". The Globe and Mail. Toronto. p. 1. Retrieved 30 June 2011. ^ Treble, Patricia (8 July 2010). "The Queen's man on the ground". Maclean's. Toronto: Rogers Communications (July 2010). ISSN 0024-9262. Retrieved 10 July 2010. ^ Government of Canada. "Frequently Asked Questions". 2010 Royal Tour. Archived from the original on 21 June 2010. Retrieved 15 June 2010. ^ Palmer, Sean; Aimers, John (2002). "The Cost of Canada's Constitutional Monarchy: $1.10 per Canadian" (2 ed.). Toronto: Monarchist League of Canada. Archived from the original on 19 June 2008. Retrieved 15 May 2009. ^ Charters, Claire; Erueti, Andrew (2008). Māori property rights and the foreshore and seabed: the last frontier. Melbourne: Victoria University Press. p. 31. ISBN 978-0-86473-553-9. ^ Mishra, Shree Govind (2000). Democracy in India. Delhi: Sanbun Publishers. pp. 51–52. ISBN 978-3-473-47305-2. ^ Macgregor Dawson, Robert (1970). The Government of Canada (5th ed.). Toronto: University of Toronto Press. p. 63. ^ Various (20 March 2013). In Committee from the Senate: Legal and Constitutional Affairs - March 20, 2013 (Digital video). Ottawa: CPAC. Archived from the original on 13 April 2015. ^ Gallant, Jacques (4 September 2013). "Markham law graduate fighting Catholic ban on royal succession". Toronto Star. Retrieved 4 September 2013. ^ Yogaretnam, Shaamini (24 August 2013). "The boy who won't be king: uOttawa law grad challenging succession rules". Ottawa Citizen. Archived from the original on 27 August 2013. Retrieved 4 September 2013. ^ "Royal succession law not subject to charter challenge: court". CTV News. August 26, 2014. Retrieved August 29, 2014. ^ Teskey v. Canada (Attorney General) , Blair, Pepall, and Hourigan (Court of Appeal for Ontario 26 August 2014). ^ a b c Bousfield, Arthur; Toffoli, Gary. "Facts About Canada's Monarchy". The Canadian Royal Heritage Trust. Archived from the original on 5 May 2008. Retrieved 28 May 2009. ^ Jackson, Michael D. (2003). "Golden Jubilee and Provincial Crown" (PDF). Canadian Monarchist News. Toronto: Monarchist League of Canada. 7 (3): 6. Archived from the original (PDF) on 26 October 2007. Retrieved 21 May 2009. ^ Chief Myles Venne and all of the Councllors of the Lac La Ronge Indian Band v. Her Majesty the Queen in Right of Canada and Her Majesty the Queen in Right of the Province of Saskatchewan , Q.B. No. 2655 of 1987 (Court of Queen's Bench for Saskatchewan 14 July 1987). ^ Ministry of Natural Resources (24 January 2006). "Disposition of Public Land to Other Governments and Agencies" (PDF). 3.2.B. Toronto: Queen's Printer for Ontario: 2. Archived from the original (PDF) on 14 January 2015. Retrieved 25 April 2010. ^ Office of the Prime Minister of Canada (4 November 2012). "PM announces new Advisory Committee on Vice-Regal Appointments". Queen's Printer for Canada. Archived from the original on 6 November 2012. Retrieved 4 November 2012. ^ Davies, Robertson (8 August 1996). Hunting Stuart and The Voice of the People. Toronto: Simon & Pierre. ISBN 978-0-88924-259-3. ^ a b c d e f g Table Research Branch of the House of Commons (March 2008). "Compendium of Procedure" (PDF). Ottawa: Queen's Printer for Canada: 1. Archived from the original (PDF) on 17 December 2009. Retrieved 14 October 2009. ^ Legislative Assembly of Ontario (1996). "Committee Transcripts". Standing Committee on the Legislative Assembly - 1996-Apr-10 - Bill 22, Legislative Assembly Oath of Allegiance Act, 1995. Toronto: Her Majesty the Queen in Right of Ontario. Retrieved 28 November 2015. ^ Tildridge, Nathan (2011). Canada's Constitutional Monarchy. Toronto: Dundurn. pp. 79, 143. ^ Bell, Lynne; Bousfield, Arthur; Toffoli, Gary (1997). Queen and Consort: Elizabeth and Philip: 60 Years of Marriage. Toronto: Dundurn Press. p. 125. ^ Department of Canadian Heritage (2010). Symbols of Canada (PDF). Ottawa: Queen Printer for Canada. p. 3. ISBN 978-1-100-14692-8. ^ Assembly of First Nations; Elizabeth II (2004). "A First Nations – Federal Crown Political Accord" (PDF). 1. Ottawa: Assembly of First Nations: 3. Archived from the original (PDF) on 29 December 2009. Retrieved 29 September 2009. ^ Canada (PDF) (Map). Queen's Printer for Canada. 2006. Archived from the original (PDF) on 26 March 2009. Retrieved 16 May 2009. ^ Beauchesne, Arthur (1958). Rules & Forms of the House of Commons of Canada (4 ed.). Toronto: The Carswell Company Limited. p. 14. ISBN 0-459-32210-9. ^ "The Form and Order of Service that is to be performed and the Ceremonies that are to be observed in the Coronation of Her Majesty Queen Elizabeth II in the Abbey Church of St. Peter, Westminster, on Tuesday, the second day of June 1953". Anglican Liturgical Library. Retrieved 16 May 2009. ^ a b c The Royal Household. "The Queen and the Commonwealth > Queen and Canada". Queen's Printer. Retrieved 14 May 2009. ^ Roach v. Canada (Attorney General) , 05-CV-301832 CP (Ontario Superior Court 23 January 2009). ^ a b "In the Wake of Constitutional Crisis: New Survey Demonstrates that Canadians Lack Basic Understanding of Our Country's Parliamentary System" (PDF). Toronto: Ipsos Reid. 15 December 2008: 1. Retrieved 18 May 2010. ^ a b Boswell, Randy (7 October 2009). "Governor General calling herself 'head of state' riles monarchists". Ottawa Citizen. Archived from the original on 10 October 2009. Retrieved 7 October 2009. ^ McWhinney, Edward (2005). The Governor General and the Prime Ministers. Vancouver: Ronsdale Press. p. 8. ISBN 1-55380-031-1. ^ Office of the Governor General of Canada. "The Office > Annual Reports > Report on Performance". Queen's Printer for Canada. Archived from the original on 24 February 2009. Retrieved 7 October 2009. ^ Office of the Governor General of Canada. "The Office > Annual Reports > 2003–2004 > Annual Report 2003–2004". Queen's Printer for Canada. Archived from the original on 20 February 2006. Retrieved 7 October 2009. ^ Office of the Governor General of Canada. "Governor General > Role and Responsibilities". Queen's Printer for Canada. Archived from the original on 11 December 2007. Retrieved 15 May 2009. ^ "Media > News Releases and Messages > For the First Time, a Head of State is Officially Welcomed at the Governor General's Residence at the Citadelle: One of the Highlights of the Governor General's Program During Her Stay in Quebec City from September 18 to 24, 2006". Office of the Governor General of Canada. Queen's Printer for Canada. 18 September 2006. Retrieved 4 December 2016. ^ Heard, Andrew (January 2009). "The Governor General's Decision to Prorogue Parliament: Parliamentary Democracy Defended or Endangered" (PDF). Points of View. Edmonton: Centre for Constitutional Studies. Discussion Paper No. 7: 12. ISBN 978-0-9811751-0-2. Archived from the original (PDF) on 28 November 2010. Retrieved 10 October 2009. ^ Geddes, John (9 October 2009). "How the term "head of state" is actually used in Canada". Maclean's. Toronto: Roger's Communications. ISSN 0024-9262. Retrieved 10 October 2009. ^ Office of the Governor General of Canada. "Governor General > State Visits". Queen's Printer for Canada. Archived from the original on 4 December 2008. Retrieved 7 October 2009. ^ a b Gardner, Dan (9 October 2009). "A very Canadian coup". Ottawa Citizen. Archived from the original on 19 January 2013. Retrieved 10 October 2009. ^ Department of Canadian Heritage (24 September 2014). "The Crown". Her Majesty the Queen in Right of Canada. Archived from the original on 1 January 2016. Retrieved 8 November 2015. ^ Department of Canadian Heritage (2 October 2014). "Governor General Ceremonies". Her Majesty the Queen in Right of Canada. Archived from the original on 2 January 2016. Retrieved 8 November 2015. ^ Jackson, Michael (2002). "Political Paradox: The Lieutenant Governor in Saskatchewan". In Leeson, Howard A. Saskatchewan Politics Into the 21st Century. Regina: Canadian Plains Research Center. ^ Gardner, Dan (17 February 2009). "A stealth campaign against the Queen". Calgary Herald. Archived from the original on 17 June 2009. Retrieved 26 February 2009. ^ Fidelis (2004). "Canadian Confusion on Juno Beach" (PDF). Canadian Monarchist News. Toronto: Monarchist League of Canada. Summer 2004 (22): 2. Archived from the original (PDF) on 14 November 2013. Retrieved 16 August 2012. ^ a b Gardner, Dan (13 February 2009). "Governor General to Dan Gardner: you're right". Ottawa Citizen. Archived from the original on 7 July 2012. Retrieved 26 July 2009. ^ Geddes, John (9 October 2009). "If you do all the head-of-state stuff, aren't you the head of state?". Maclean's. Toronto: Roger's Communications. ISSN 0024-9262. Retrieved 10 October 2009. ^ EKOS Research Associates (30 May 2002). "F. Monarchy". Trust and the Monarchy: an examination of the shifting public attitudes toward government and institutions (PDF). Montreal: EKOS Research Associates. p. 47. Archived from the original (PDF) on 19 December 2008. Retrieved 8 February 2009. ^ Privy Council Office (2008). Accountable Government: A Guide for Ministers and Ministers of State—2008. Ottawa: Queen's Printer for Canada. p. 45. ISBN 978-1-100-11096-7. Archived from the original on 18 March 2010. Retrieved 17 May 2009. ^ Prince, Peter (24 November 2003). "We are Australian: The Constitution and Deportation of Australian-born Children". Queen's Printer for Australia. Research Paper no. 3 200304, Law and Bills Digest Group. Archived from the original on 2 July 2009. Retrieved 16 May 2009. ^ a b Cox, Noel (September 2002). "Black v Chrétien: Suing a Minister of the Crown for Abuse of Power, Misfeasance in Public Office and Negligence". Murdoch University Electronic Journal of Law. Perth: Murdoch University. 9 (3): 12. Retrieved 17 May 2009. ^ a b Office of the Governor General of Canada. "The Great Seal of Canada". Queen's Printer for Canada. Retrieved 14 December 2015. ^ a b Department of Canadian Heritage. "he Great Seal of Canada". Queen's Printer for Canada. Retrieved 14 December 2015. ^ Office of the Governor General of Canada. "Governor General > Role and Responsibilities > Commander-in-Chief of Canada". Queen's Printer for Canada. Archived from the original on 9 October 2006. Retrieved 20 May 2009. ^ "About Us > Treaty Principles > Fundamental Treaty Principles". Confederacy of Treaty Six First Nations. Archived from the original on 6 July 2011. Retrieved 20 May 2009. ^ a b Wrong, Humphrey Hume (10 November 1952). "Telegram 219". In Department of Foreign Affairs and International Trade Canada. Relations With the United States. Documents on Canadian External Relations. 18 – 867. Ottawa. ISBN 0-87609-352-7. Retrieved 18 May 2009. ^ a b Office of the Governor General of Canada. "Media > Fact Sheets > The Swearing-In of a New Ministry". Queen's Printer for Canada. Archived from the original on 16 June 2008. Retrieved 18 May 2009. ^ Panetta, Alexander (5 December 2008). "Off the record: what GG told Harper not for public consumption". 660 News (Rogers Broadcasting). The Canadian Press. Archived from the original on 29 December 2008. Retrieved 7 December 2012. ^ Tyler, Tracey (6 December 2008). "Politicians, scholars say Governor General must dispel secrecy". Toronto Star. Archived from the original on 9 December 2008. Retrieved 7 December 2008. ^ Russell, Peter (1983). "Bold Statecraft, Questionable Jurisprudence". In Banting, Keith G.; Simeon, Richard. And no one cheered: federalism, democracy, and the Constitution Act. Toronto: Taylor & Francis. p. 217. ISBN 978-0-458-95950-1. Retrieved 12 June 2010. ^ Office of the Governor General of Canada. "The Governor General – the evolution of Canada's oldest public institution". Queen's Printer for Canada. Retrieved 16 January 2011. ^ "Martin Government Removes Queen From Diplomatic Documents" (PDF). Canadian Monarchist News. Toronto: Monarchist League of Canada. Spring 2005 (23): 2. 2005. Archived from the original (PDF) on 25 June 2008. Retrieved 17 March 2007. ^ Schmitz, Gerald (December 1988). "The Opposition in a Parliamentary System". Ottawa: Queen's Printer for Canada. ISBN 0-660-13283-4. Archived from the original on 25 April 2009. Retrieved 21 May 2009. ^ a b "Archived copy". Parliamentary Debates (Hansard). Senate. 17 February 2000. col. 1500–1510. Archived from the original on 4 September 2007. Retrieved 21 November 2009. ^ Honsberger, John (2004). Osgoode Hall: An Illustrated History. Osgoode Society for Canadian Legal History. pp. 219–20. ^ "Calgary courtroom home to special exhibit". CTV News. 19 March 2012. ^ Public Prosecution Service of Canada (October 2005). The Federal Prosecution Service Deskbook. Ottawa: Queen's Printer for Canada. 35.4.3. Archived from the original on 21 May 2009. Retrieved 30 May 2009. ^ Dimmock, Gary (27 February 2008). "The quality of mercy". Ottawa Citizen. Archived from the original on 4 May 2008. Retrieved 4 August 2008. ^ Dunsmuir, Molly (22 November 2004). "Euthanasia and Assisted Suicide" (Paper). Queen's Printer for Canada. Retrieved 20 May 2009. ^ Mallory, James (2011). Russell, Peter H; Leuprecht, Christian, eds. "The Pattern of the Constitution". Essential Readings in Canadian Constitutional Politics. University of Toronto Press: 16. ^ Pigott, Peter (2005). Royal Transport: An Inside Look at the History of Royal Travel. Toronto: Dundurn Press. p. 14. ISBN 978-1-55002-572-9. ^ Office of the Governor General of Canada. "The Office > Annual Reports > 2004–2005 > Report on Performance". Queen's Printer for Canada. Archived from the original on 8 June 2008. Retrieved 22 May 2009. ^ Veterans Affairs Canada. "Canada Remembers > Memorials to Canadians' Achievements and Sacrifices > First World War Memorials in Europe > Vimy Memorial > The Battle of Vimy Ridge > The Canadian National Vimy Memorial – Fast Facts". Queen's Printer for Canada. Retrieved 24 May 2009. ^ Foot, Richard (4 April 2007). "Vimy memorial had a turbulent history of its own". The Vancouver Sun. p. A4. ^ Elizabeth II (1957). "Radio address to Canadians" (PDF). In The Royal Household. Images and Broadcasts > The Queen's Speeches. London: Queen's Printer. Retrieved 3 October 2008. ^ "Royal Visit". Time. New York: Time Inc. IXX (17). 21 October 1957. ISSN 0040-781X. Retrieved 22 May 2009. ^ Buckner, Phillip Alfred (31 July 2005). Canada and the End of Empire. Vancouver: UBC Press. p. 69. ISBN 978-0-7748-0916-0. ^ The Royal Household. "Past events (Court Circular) > Search the Court Circular > 13 May 1998". Queen's Printer. Retrieved 22 May 2009. ^ Canadian Royal Heritage Trust. "Elizabeth II Queen of Canada". Canadian Royal Heritage Trust. Archived from the original on 18 April 2008. Retrieved 22 May 2009. ^ Valpy, Michael (8 June 2004). "A Queen and her agent may mix". The Globe and Mail. ^ "Remembering Vimy – 90th Anniversary Celebrations on CTV, April 9". CTV. 4 April 2007. Archived from the original on 18 June 2008. Retrieved 22 May 2009. ^ "Royal Respect for Canada's Vimy Heroes, Queen of Canada Rededicates Memorial on French Soil" (PDF). Canadian Monarchist News. Toronto: Monarchist League of Canada. Summer 2007 (26): 3. 2007. Archived from the original (PDF) on 25 June 2008. Retrieved 22 May 2009. ^ "Prince Charles, Clarkson honour D-Day fallen". CTV. 6 June 2004. Archived from the original on 5 June 2008. Retrieved 22 May 2009. ^ The Royal Household. "Past events (Court Circular) > Search the Court Circular > 14 April 2007". Queen's Printer. Retrieved 22 May 2009. ^ "Another Member of the Canadian Royal Family Performs Duties Abroad" (PDF). Canadian Monarchist News. Toronto: Monarchist League of Canada. Summer 2007 (26): 4. 2007. Archived from the original (PDF) on 25 June 2008. Retrieved 22 May 2009. ^ The Royal Household. "Past events (Court Circular) > Search the Court Circular > 7–8 June 2008". Queen's Printer. Retrieved 22 May 2009. ^ a b c Government of Canada. "2010 Royal Tour > Frequently Asked Questions > Who pays for Royal Tours of Canada?". Queen's Printer for Canada. Archived from the original on 21 June 2010. Retrieved 15 June 2010. ^ "Queen arrives in Saskatchewan". CBC. 18 May 2005. Archived from the original on 3 December 2010. Retrieved 22 May 2009. ^ a b Jackson, Michael (2004). "The "Working" Princess: Saskatchewan Welcomes the Princess Royal" (PDF). Canadian Monarchist News. Toronto: Monarchist League of Canada. Summer 2004 (24): 8. Archived from the original (PDF) on 25 June 2008. Retrieved 22 May 2009. ^ Canada Post (January–March 2006). "Queen Elizabeth: 1926–2006". Canada's Stamp Details. Ottawa: Queen's Printer for Canada. XV (1). Archived from the original on 23 October 2007. Retrieved 14 September 2007. ^ Department of Canadian Heritage. "Subjects > Citizenship and Identity > Ceremonial and Canadian Symbols Promotion > Reinforcement of constitutional links with the institutions of the Canadian Monarchy". Queen's Printer for Canada. Retrieved 22 May 2009. ^ a b "Debates of the Senate" (PDF). Parliamentary Debates (Hansard). Senate. 27 May 2008. col. 1373–1374. Archived from the original (PDF) on 26 March 2009. ^ Sharp, Mitchell (1994). Which Reminds Me: A Memoir. Toronto: University of Toronto Press. p. 223. ISBN 978-0-8020-0545-8. ^ a b c McCreery, Christopher (10 June 2010). "The Crown and Honours: Getting it Right" (PDF). Kingston: Queen's University Press: 1. Archived from the original (PDF) on 26 August 2010. Retrieved 11 August 2010. ^ Royal Canadian Mounted Police. "Honours and Recognition Programs > Canadian National Honours". Queen's Printer for Canada. Archived from the original on 23 March 2009. Retrieved 20 May 2009. ^ "Royal Crown and Cypher". Government of Canada. Archived from the original on 20 December 2016. Retrieved 4 December 2016. ^ Department of Indian Affairs and Northern Development (2000). Commissioners of the Territories (PDF). Ottawa: Queen's Printer for Canada. p. 82. ISBN 0-662-63769-0. Archived from the original (PDF) on 13 June 2011. Retrieved 24 May 2009. ^ "The Royal Family". Queen's Printer for Canada. 24 September 2014. Archived from the original on 2 January 2016. Retrieved 12 December 2015. ^ Copps, Sheila (26 April 2006). "PM should ignore flag bureaucrats". Toronto Sun. Archived from the original on 6 May 2006. Retrieved 29 July 2007. ^ Office of the Provincial Secretary. "About OPS > Protocol Office > Royal Visits > Royal Family Titles". Queen's Printer for Saskatchewan. Archived from the original on 3 October 2011. Retrieved 1 October 2009. ^ Department of Canadian Heritage. "Ceremonial and Canadian Symbols Promotion > The Canadian Monarchy > Royal Family". Queen's Printer for Canada. Retrieved 24 May 2009. ^ "Montrealer Autumn Kelly weds Queen's eldest grandson". CBC. 17 May 2008. Retrieved 24 May 2009. ^ "Queen's first great-grandchild has Canadian roots". CTV. 30 December 2010. Retrieved 2 January 2011. ^ "The Queen becomes a great grandmother for the second time". CTV. 30 March 2012. Archived from the original on 31 March 2012. Retrieved 30 March 2012. ^ Royal Household. "The current Royal Family > Succession and precedence > Succession". Queen's Printer. Retrieved 4 March 2015. ^ Aralt Mac Giolla Chainnigh v. the Attorney-General of Canada , T-1809-06, 14.4 (Federal Court of Canada 21 January 2008). ^ Holloway, Ian (2007). "Constitutional Silliness and the Canadian Forces" (PDF). Canadian Monarchist News. Toronto: Monarchist League of Canada. Summer 2007 (26): 9. Archived from the original (PDF) on 25 June 2008. Retrieved 14 June 2009. ^ Buckner, Phillip (2005). "The Last Great Royal Tour: Queen Elizabeth's 1959 Tour to Canada". In Buckner, Phillip. Canada and the End of Empire. Vancouver: UBC Press. p. 66. ISBN 0-7748-0915-9. Retrieved 24 October 2009. ^ Gowdy, Douglas M. (18 October 1967). "Loyal Societies Dinner in Honor of Princess Alexandra. Remarks by Douglas M. Gowdy. The Loyal Societies Toast to Canada by Col. B.J. Legge.". In Empire Club of Canada. The Empire Club of Canada Addresses, 1967–1968. Toronto: The Empire Club Foundation (published 1968). pp. 107–113. Retrieved 9 September 2009. ^ Valpy, Michael (8 July 2011). "So long, young royals, you did good". CBC. Retrieved 8 July 2011. ^ Editorial Board (30 June 2011). "The royal visit is no mere celebrity event". The Globe and Mail. Toronto. Retrieved 5 July 2011. ^ "Monarchy > Elizabeth II, Queen of Canada". Canadian Royal Heritage Trust. Archived from the original on 5 January 2010. Retrieved 10 May 2012. ^ Treble, Patricia (2011). "Royal Redux". Maclean's: The Royal Tour. Toronto: Rogers Media: 66. ^ Hall, Trevor (1989). Royal Canada: A History of Royal Visits for Canada since 1786. Toronto: Archive. ISBN 978-0-88665-504-4. ^ Waite, P. B. (2000). "Campbell, John George Edward Henry Douglas Sutherland, Marquess of Lorne and 9th Duke of Argyll". In English, John. Dictionary of Canadian Biography. XIV. Ottawa: University of Toronto/Université Laval. Retrieved 24 May 2009. ^ a b c Toffoli, Gary. "The Royal Family and the Armed Forces". Canadian Royal Heritage Trust. Archived from the original on 1 July 2007. Retrieved 24 May 2009. ^ Office of the Governor General of Canada. "Governor General > Former Governors General > Field Marshal His Royal Highness the Prince Arthur, Duke of Connaught and Strathearn". Queen's Printer for Canada. Archived from the original on 16 November 2008. Retrieved 30 April 2009. ^ Office of the Governor General of Canada. "Governor General > Former Governors General > Major General The Earl of Athlone". Queen's Printer for Canada. Archived from the original on 13 March 2008. Retrieved 24 March 2009. ^ Government of Canada. "Membres de la Famille royale". Queen's Printer for Canada. Archived from the original on 2 January 2016. Retrieved 1 December 2014. ^ Elizabeth II (4 October 2002). "Speech Given by The Queen at the Legislative Assembly of Nunavut on Friday 4 October 2002". Written at Iqualuit. In Voost, Geraldine. Etoile's Unofficial Royalty Site. London: Geraldine Voost (published 1 September 2004). Retrieved 24 May 2009. ^ Pedwell, Terry. "Princess Anne to take part in Remembrance Day and rededication of memorial". The Canadian Press. Archived from the original on 4 June 2015. Retrieved 1 December 2014. ^ Rayner, Gordon (30 June 2011). "Royal tour: Prince William and Kate Middleton fly to Canada for first overseas tour as married couple". The Telegraph. London. Retrieved 5 July 2011. ^ Palmer, Randall (30 June 2011). "Canadian cities ready to welcome Royals". Toronto Sun. Toronto. Retrieved 5 July 2011. ^ Hough, Andrew (30 May 2011). "Royal tour: Duke and Duchess of Cambridge's 14,000-mile first official trip". The Telegraph. London. Retrieved 5 July 2011. ^ Skaarup, Harold A (2012). Shelldrake: Canadian Artillery Museums and Gun Monuments. Bloomington: iUniverse. p. 119. ^ Tidridge, Nathan (2015). The Queen at the Council Fire: The Treaty of Niagara, Reconciliation, and the Dignified Crown in Canada. Toronto: Dundurn Press. ISBN 978-1-4597-3068-7. Retrieved 8 December 2015. ^ Bousfield, Arthur; Toffoli, Gary (2010). Royal Tours 1786–2010: Home to Canada. Toronto: Dundurn Press. p. 168. ISBN 978-1-4597-1165-5. Retrieved 8 December 2015. ^ Aimers, John (April 1996). "The Palace on the Rideau". Monarchy Canada. Toronto: Monarchist League of Canada (Spring 1996). Archived from the original on 6 June 2008. Retrieved 20 February 2009. ^ Lanctot, Gustave (1964). Royal Tour of King George VI and Queen Elizabeth in Canada and the United States of America 1939. Toronto: E.P. Taylor Foundation. ASIN B0006EB752. ^ Buchan, John (2009). Complete Works of John Buchan (Illustrated). Essex: Delphi Classics. ISBN 978-1-909496-58-3. ^ Toffoli, Gary (April 1995). "The Hnatyshyn Years". Monarchy Canada. Toronto: Monarchist League of Canada (Spring 1995). Archived from the original on 12 October 2006. Retrieved 20 February 2009. ^ Office of the Governor General of Canada. "Rideau Hall". Queen's Printer for Canada. Archived from the original on 20 December 2007. Retrieved 25 May 2009. ^ Office of the Governor General of Canada. "Media > Fact Sheets > Collection of Art and Furniture at Rideau Hall > The Crown Collection at Rideau Hall". Queen's Printer for Canada. Archived from the original on 9 October 2008. Retrieved 27 May 2009. ^ Campagnolo, Iona (5 February 2007). "Speech to Retired Heads of Mission Association's Gala Dinner". In Office of the Lieutenant Governor of British Columbia. Government House. Victoria: Queen's Printer for British Columbia. ISBN 0-662-50343-0. Archived from the original on 1 May 2009. Retrieved 27 May 2009. ^ Boutros, Magdaline (August–September 2008). "Deep History". Destinations. Ottawa: Via Rail. 5 (4). ^ "City designates Diefenbunker a heritage site". CBC. 13 April 2006. Archived from the original on 12 August 2007. Retrieved 27 May 2009. ^ Department of Canadian Heritage. "Ceremonial and Canadian Symbols Promotion > The Canadian Monarchy > Royal Visit 2001 > Getting to Know the Prince(s) of Wales". Queen's Printer for Canada. Retrieved 8 August 2007. ^ McDougall, D. Blake. "Public information > Princess Louise Caroline Alberta > II. Canada Years (1878–1883)". Queen's Printer for Alberta. Archived from the original on 18 July 2015. Retrieved 3 October 2009. ^ British Columbia Archives. "Golden Jubilee > Welcoming the Royals: The Archival Legacy > The Legacy". Queen's Printer for British Columbia. Archived from the original on 28 February 2009. Retrieved 27 May 2009. ^ "Princess Margaret leaves her fortune to her children". Hello!. London: Hello Ltd. 26 June 2002. Retrieved 27 May 2009. ^ Archives of Ontario. "A Celebration of the Golden Jubilee of Queen Elizabeth II > Behind the Scenes". Queen's Printer for Ontario. Archived from the original on 15 December 2008. Retrieved 27 May 2009. ^ Office of the Governor General of Canada (10 September 2012). "Working Visit to Canada by The Earl and Countess of Wessex". Queen's Printer for Canada. Retrieved 10 September 2012. ^ "How Prince Edward and Sophie forged deep ties with Canada". CBC. 18 September 2012. Retrieved 18 September 2012. ^ "Mohawk Chapel > History". Her Majesty's Chapel of the Mohawks. Archived from the original on 26 March 2009. Retrieved 28 May 2009. ^ "The History and Architecture of St. Barts". St. Bartholomew's Anglican Church. Archived from the original on 4 January 2015. Retrieved 15 December 2014. ^ Harper, Stephen. "Prime Minister Harper introduces Australian counterpart to Parliament". Queen's Printer for Canada. Archived from the original on 29 March 2010. Retrieved 12 November 2008. ^ Odrowaz-Sypniewska, Margaret. "The Four Indian Kings". The Courtly Lives of Kings, Peerage, Saints, Knights, and the Commoners. Retrieved 24 May 2009. ^ "Heritage Saint John > Canadian Heraldry". Heritage Resources of Saint John and New Brunswick Community College. Archived from the original on 17 June 2011. Retrieved 3 July 2009. ^ Joyal, Serge (10 June 2010). "Diminishing the Crown". The Globe and Mail. Toronto. Retrieved 13 August 2010. ^ "Queen drops puck, raises cheer in arena". CBC. 6 October 2002. Retrieved 13 May 2006. ^ "Queen helps CBC TV mark 50th anniversary". CBC. 10 October 2002. Retrieved 13 May 2006. ^ "Queen begins visit to New Brunswick". CBC. 11 October 2002. Retrieved 13 May 2006. ^ Office of the Governor General of Canada (9 September 2015). "Message from the Governor General of Canada Marking the Historic Reign of Her Majesty The Queen". Queen's Printer for Canada. Retrieved 9 September 2015. ^ Clarkson, Adrienne (2009). Russell, Peter; Sossin, Lorne, eds. Parliamentary Democracy in Crisis. Toronto: University of Toronto Press. p. ix. ISBN 978-1-4426-1014-9. ^ Valpy, Michael (8 June 2015). "Who takes the Crown". National Post. Retrieved 8 June 2015. ^ a b Pepall, John (1 March 1990). "Who is the Governor General?". The Idler. Toronto. Archived from the original on 6 July 2011. Retrieved 15 July 2015. ^ Geddes, John (25 January 2009). "Will the prorogation of Parliament set off a populist revolt?". Maclean's. Toronto: Kenneth Whyte. ISSN 0024-9262. Retrieved 27 January 2010. ^ Jackson, Michael D. (2009). "The Senior Realms of the Queen" (PDF). Canadian Monarchist News. Toronto: Monarchist League of Canada. Autumn 2009 (30): 10. Archived from the original (PDF) on 17 November 2009. Retrieved 17 January 2010. ^ Blair, Louisa (2001). Venne, Michel, ed. Vive Quebec! : new thinking and new approaches to the Quebec nation. Toronto: James Lorimer & Company. p. 91. ISBN 978-1-55028-734-9. ^ Neitsch, Alfred Thomas (2006). In loco Regis: The Contemporary Role of the Governor General and Lieutenant Governor in Canada. Edmonton: University of Alberta Press. p. 39. ^ "Policy Declaration" (PDF). Ottawa: Conservative Party. 29 March 2005: 1. Archived from the original (PDF) on 20 December 2010. Retrieved 1 June 2010. ^ Thompson, Elizabeth (17 April 2007). "Royal rumble: Queen not welcome at Quebec celebrations, Duceppe says". The Gazette. Archived from the original on 7 November 2012. Retrieved 28 May 2009. ^ "Who we are and what we do". Monarchist League of Canada. Archived from the original on 23 April 2008. Retrieved 28 May 2009. ^ "Our goals". Citizens for a Canadian Republic. Retrieved 28 May 2009. ^ Mackenzie, Anne (2008). "A Short History of the United Empire Loyalists" (PDF). The United Empire Loyalists' Association of Canada: 5. Retrieved 28 May 2009. ^ "Discovering Canada's Monarchy". Canadian Royal Heritage Trust. Archived from the original on 15 April 2008. Retrieved 28 May 2009. ^ "Purpose Statement > What the Association Stands For". Loyal Orange Association. Retrieved 28 May 2009. ^ "Canadians apathetic about Prince Charles: poll". CBC. 26 October 2009. Retrieved 21 September 2015. ^ Bethune, Brian; Treble, Patricia (1 July 2010). "Who will wear the crown in Canada?". Maclean's. Toronto: Rogers Communications (July 2010). ISSN 0024-9262. Retrieved 6 July 2010. ^ "Arguments for Repatriating the Monarchy". The Monarchist. 25 June 2010. Retrieved 23 June 2010. ^ Gillespie, Kevin (2010). "A Uniquely Canadian Crown?" (PDF). Canadian Monarchist News. Toronto: Monarchist League of Canada. Spring-Summer 2010 (31): 11. Archived from the original (PDF) on 18 December 2014. Retrieved 18 December 2014. Bousfield, Arthur; Toffoli, Gary (1991). Royal Observations: Canadians and Royalty. Hamilton: Dundurn Press. ISBN 1-55002-076-5. Canadian Press (2002). Queen Elizabeth II and the Royal Family in Canada (Golden Jubilee). Toronto: Quarry Heritage. ISBN 1-55082-301-9. Coates, Colin (2006). Majesty In Canada: Essays On The Role of Royalty. Hamilton: Dundurn Press. ISBN 1-55002-586-4. Monet, Jacques (1979). The Canadian Crown. Toronto-Vancouver: Clarke, Irwin & Company Ltd. ISBN 0-7720-1252-0. Munro, Kenneth (1977). Coates, Colin, ed. "The Crown and French Canada: The role of the Governors-General in Making the Crown relevant, 1867–1917". Imperial Canada. The University of Edinburgh: 109–121. Munro, Kenneth (March 2001). "Canada as Reflected in her Participation in the Coronation of her Monarchs in the Twentieth Century". Journal of Historical Sociology. 14: 21–46. doi:10.1111/1467-6443.00133. Smith, David E. (1999). The Republican Option in Canada: Past and Present. Toronto-Buffalo-London: University of Toronto Press. ISBN��0-8020-4469-7. Tasko, Patti (2007). Canada's Queen: Elizabeth II: A Celebration of Her Majestys Friendship with the People of Canada. Toronto: John Wiley & Sons. ISBN 0-470-15444-6. Tidridge, Nathan; Guthrie, Gavin (2007). The Canadian Monarchy: Exploring the role of Canada's Crown in the day-to-day life of our country. Toronto: Monarchist League of Canada. ISBN 0-9781853-0-7. Vaughan, Frederick (2004). Canadian Federalist Experiment: From Defiant Monarchy to Reluctant Republic. Montreal: McGill-Queen's University Press. ISBN 0-7735-2537-8. Howe, John (1957). The Sceptre and the Mace (Film). Ottawa: National Film Board. Wikimedia Commons has media related to Canadian monarchy.